Looking for more Perl info? Have a look at our Perl links page. It has been almost three years since the release of Win32 Perl Programming: The Standard Extensions. Many things have changed and the demand has been high for a second edition. Well, the wait is over. The ever popular TSE book has been updated with a second edition! This second edition covers new material such as Win32 security, COM events, Windows Terminal Services, the Win32::Lanman module and the list goes on. 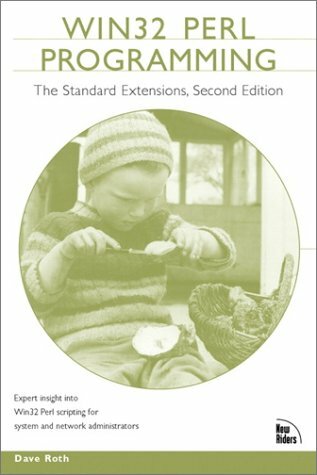 Packed with hundreds of new pages and over 150 new code examples Win32 Perl Programming: The Standard Extensions, Second Edition helps decode the complexities of Win32 Perl programming. This book is now available online as part of the online Safari library! Read our own Dave Roth's articles from The Windows IT Pro Scripting site. This is a great resource for anyone who needs to administrate Windows machines. The newsletter covers a range of scripting languages such as Perl, VB and Java. Are You New To Perl? Our site has both forums and a blog discussing Perl (in particular Windows Perl). You can see what others are thinking as well as post your own thoughts. Our second book is out in the bookstores! In this excellent book author Dave Roth shows how to tame some of the more tedious problems of Win32 administration. His weapon of choice: Perl, of course. Based on the author's experience, the book details philosophies and strategies relating to how administrators can increase productivity without having to manually perform tasks or purchase costly software. The result: remarkable savings in administration time and cost. Administrators will appreciate the ready-to-run scripts that automate mundane and repetitive tasks, achieving their goals exponentially faster than previously possible. Managers will marvel over the cost savings in both software and administrative manpower. The book is available in bookstores. You can also order it now through Amazon.com. 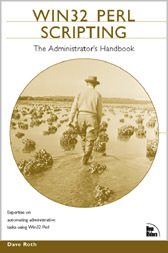 We have more information on Win32 Perl Scripting: Administrator's Handbook. Our Win32 Perl Programming: The Standard Extensions book is also available through Amazon.com. More information on this book is available as well. You can also check out our recommended book page. UNIX administrators can now rejoice! Any UNIX administrator can tell you that users can access their home directories by using the tilde (~) character. This functionality does not exist on NT, until now. The ~Home ISAPI Filter allows user directories to be accessed by prefixing a user account with a ~ (or any other) token. The filter is totally configurable and can map a user's home directory, profile directory, or some other directory. With caching and cross domain support this ISAPI filter is a perfect compliment to NT's IIS web server. More info is on the ~Home ISAPI Filter page. Our Perl Script Repository is a place to go when you are in need of a Perl script. You may not find the perfect script that fits your needs however it may be the just place to peruse scripts that can get you started. The repository is a place for Perl coders to submit scripts that have served them well so that others can benefit from them. It also provides a place for good programmers to be discovered. Each script is linked to its author's brief biography. This is useful when looking for a programmer to contract with. In July, 1999, Dave Roth presented a white paper at the LISA-NT Conference in Seattle, Washington. The paper outlines a strategy for implementing a network management system using off-the-shelf products such as Perl. This low cost infrastructure is the equivalent to a poor-man's SMS at only a fraction of the cost of implementing Microsoft's Systems Management Server or other commercial SMS products. The white paper A Networked Machine Management System is available online as is the PowerPoint presentation. A slide show on Win32::ODBC that was presented at the First Annual Perl Conference in 1997 is available in both the PowerPoint version and in an online version. At the 4th Annual Perl Conference in Monterey, CA, Dave Roth gave a presentation on using Win32::OLE called Exploiting Perl on Windows with OLE/COM. This was a modified version of 1999 COM tutorial. Try using our web site search engine. This posted notice is available as a means to discover that this domain is protected by this law. Violations will be submitted to the State of Washington Attorney General's office and civil litigation may be pursued. More information about this law can be found at the Attorney General's web site.